I miss the days when my kids wanted homemade Halloween costumes. I love creating things for them, but now they’re more into other things. Sigh. At least I still get to supplement their costumes! 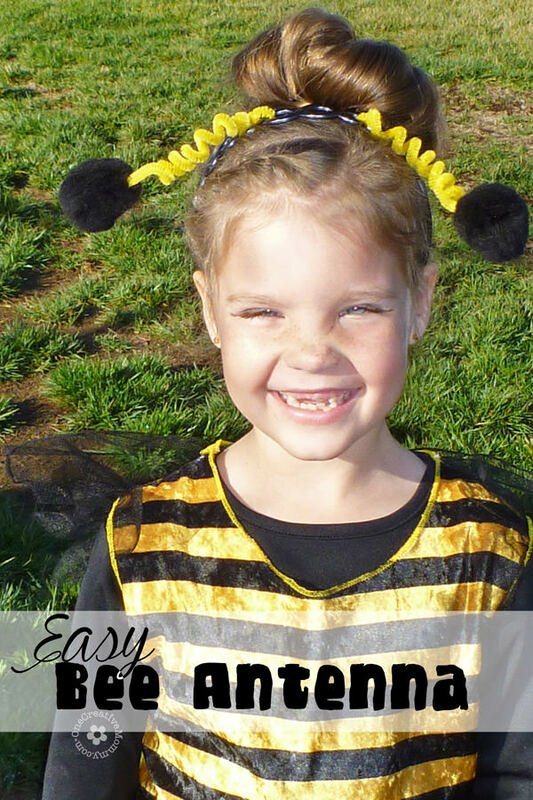 Check out these super easy DIY bee antenna that I made for Boo a couple of years ago. 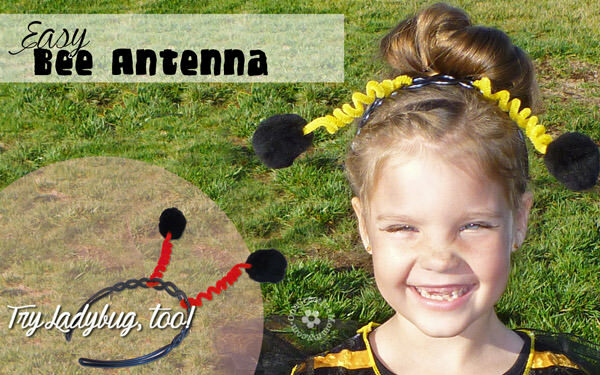 No need to buy the expensive version when you can make bee, ladybug or butterfly antenna on the cheap! We found Boo’s costume at a consignment shop for kids’ clothing, but the antenna were long gone, and we had to improvise. I may be biased, but I think our “floppy” antenna are much cuter than the ones that stand straight up and cost big bucks! RELATED: Freakishly Fun Costume Ideas, 13 Projects that will Make You Want Your Mummy! 2 yellow pipe cleaners (also called chenille stems) For butterfly or ladybug antenna, use red, pink, purple–etc. 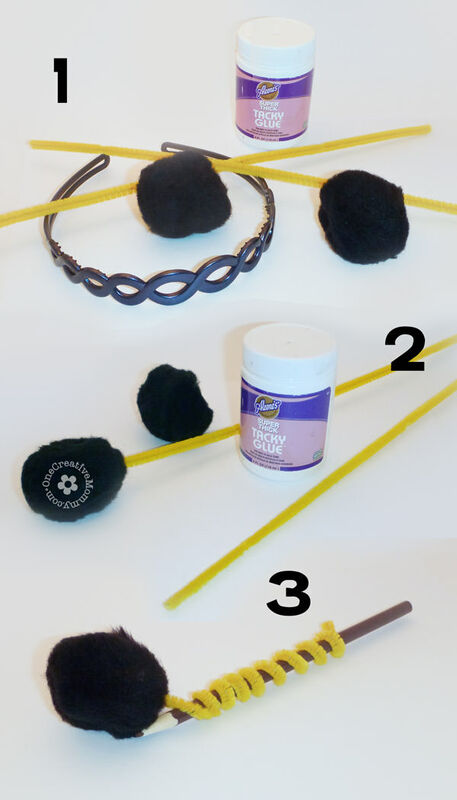 Glue each pipe cleaner to a puff ball. Using a pencil or pen, carefully twist the pipe cleaner into a spiral. Twist the free end of the pipe cleaner around the headband a few times, and them back around the pipe cleaner to attach. Adjust the “flop” to your desired look, and you’re done! How do you feel about Halloween costumes? Do you like to buy pre-made costumes or create your own? What’s the best costume you ever made? Thanks for stopping by today. I hope you’ll stick around and browse a bit! Images below are linked. Aw so sweet & Boo is adorable! What an adorable idea. 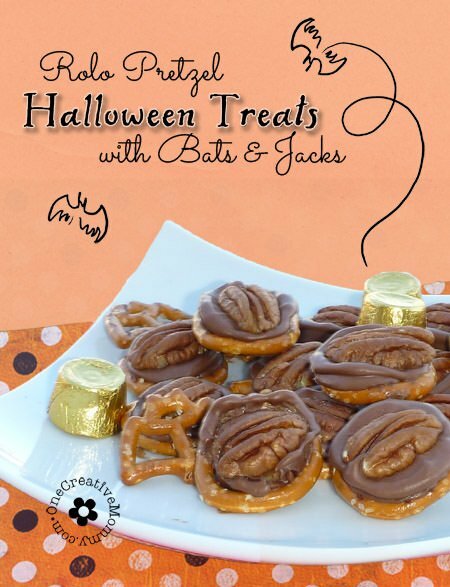 I love that you can make these in any color combination…heck..I might make one for myself this year, it would be an easy “costume” for an adult too! 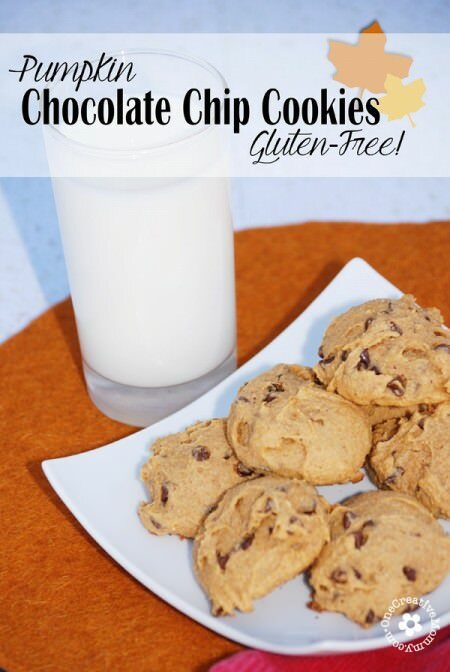 Thank you for sharing…pinning now! It would be fun for an adult costume. Thanks, Kim! That’s true, Kim. Finding a quick costume for an adult is always a good thing! That’s a wonderful solution! 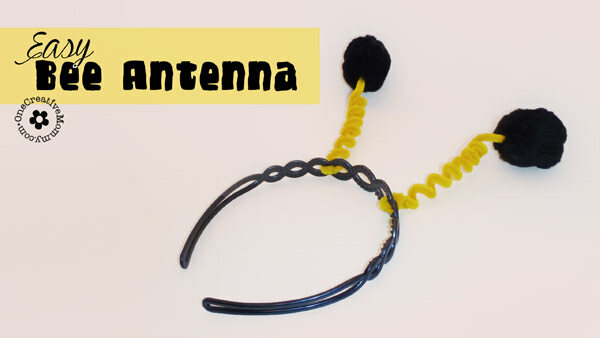 The antennae I’ve been acquainted with were both expensive AND flimsy – snapped right in half when they were worn and irritated the kids’ heads if they didn’t break! When my daughters were young we had no choice but to make costumes. “Halloween stores” didn’t exist. Once my grandkids turn five, they start asking for elaborate costumes – like the $58 Star Wars Storm Troopers I just bought two of for the twins. Yikes! But that’s what grandmas do, I guess! I can’t think of another thing I’d rather spend it on! Thanks, Joyce. My daughter was just looking at a $50 costume today. I just can’t justify it! She’ll have to sweet talk her own grandma, or we’ll have to figure out how to DIY it! Personally, I love to DIY costumes. It’s so much fun when you make it yourself. Although, I don’t think I could DIY a storm trooper! Your grandkids must love you!!! Thanks, Mitzi. I love finding cheap solutions for expensive things! 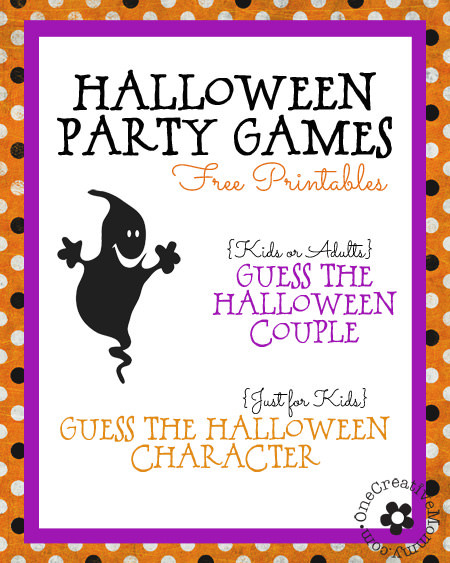 I’d love to make my kids’ costumes, but I lack the time for 4 costumes. I need to get started this weekend on our plans so I’m not rushing around at the last minute. I know how you feel, Barb. I’m secretly glad that two of my kids want to reuse their costumes from last year! Love them! And so simple to create too. You always come up with the best ideas Heidi! Oh, you’re so sweet, Clare! Thanks so much. This is so cute. I love this costume. Thanks, Candi. She was dead set that she had to be a bee! Thanks, Heather. Mine wore it to the school Halloween parade. Heidi, this is such a great craft idea! I wish I had a girl in order to make one! It would make cute alien antenna too, but I guess the curls would make them look a little girly.